Most of us are pretty clear: the way we usually produce, distribute and sell food is not in the consumer’s best interest. Fortunately, this is so obvious that individuals and communities around the world are arising to reclaim their food and find creative ways to supplant our food system. Within Pasadena / Altadena we have the facilities, the knowledge, the interest, the passion, the climate, and the need to change what we eat. The Next Course is a process to bring together our community’s visionaries so we can understand one another’s passions and skills and look for ways to work together. If you have concerns about what we eat, where our water goes, and what is happening to our environment we hope you’ll come to our next meeting and be part of the solution. Policy and Analysis: Keeping things moving in the right direction – We will collaborate to plug into the local political situation with members attached to commissions and to local politicians so we can effectively champion policies that would lead to a healthier, more sustainable, more local, and more community centered city. Initial plans are to support the drive for cool roofs and to divert materials from the waste stream into local projects (e.g. bamboo for gardeners, old wood for artists, and appropriately broken concrete for local sustainable builders). Council: Learning to work effectively together – A number of individuals have spent the last few months learning a new way to communicate championed by the Ojai Foundations Center for Council. We look to provide a forum where key members of local sustainable organizations and passionate community members will gather to get to know our passions and skills and explore how we can support one another and resource these groups to use council with their communities. Our first meeting was an inspiring success. 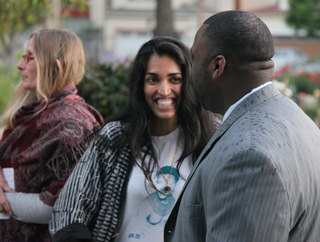 Forty-five passionate, engaged people gathered at the Armory on Earth Day to share their ideas, skills and histories and, most importantly, revealed that we have the people, facilities and the need to redefine our relationship with our food and the environment. At our second meeting we heard from Pasadena Public Health Director, Dr. Eric G. Walsh, MD, MPH, who has done great work to increase the awareness of the health impact of an inappropriate diet – as well as of stress and economic uncertainty. He is a compelling speaker whose work has increased support for healthy food and gardens. It was a great dialog around the health issues we’re facing as a community and the way in which food and gardening can play a helpful role in addressing these issues. Facilitator for the Series: Mark Rice, Executive Director of Pasadena Learning Gardens, Garden coordinator at Hathaway Sycamores and Madison Elementary School, program coordinator at Altadena Community Garden, Member of LA Food Policy Council Urban Ag working group, and Master Gardener. Dr. Eric G. Walsh, MD, MPH: City of Pasadena Public Health Director – If you’ve not heard Dr. Walsh just google Eric Walsh Pasadena and filter for videos. Marco Barrantes: Owner of La Loma Development and author of the Berkeley Food Policy Council report Feed Your City from 2002. Brian Biery: Director of Community Organizing at the Flintridge Center and who helped facilitate the Pasadena City-School work plan community meetings. 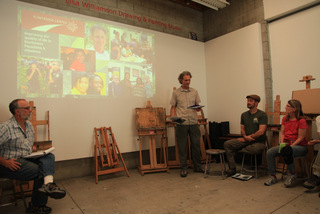 Upcoming meetings will be anounced here and at the the Pasadena Learning Gardens Urban Farmers Meetup, (http://www.meetup.com/la-kitchen-gardeners/), and other community group distribution lists. Also, check TheNextCourse.org for updates. The Next Course is funded by an anonymous grant to Pasadena Learning Gardens and is a collaboration between Pasadena Learning Gardens and La Loma Development, Transition Pasadena, The Arroyo Timebank, The Armory Center for the Arts, Pasadena’s Department of Public Health and many others.